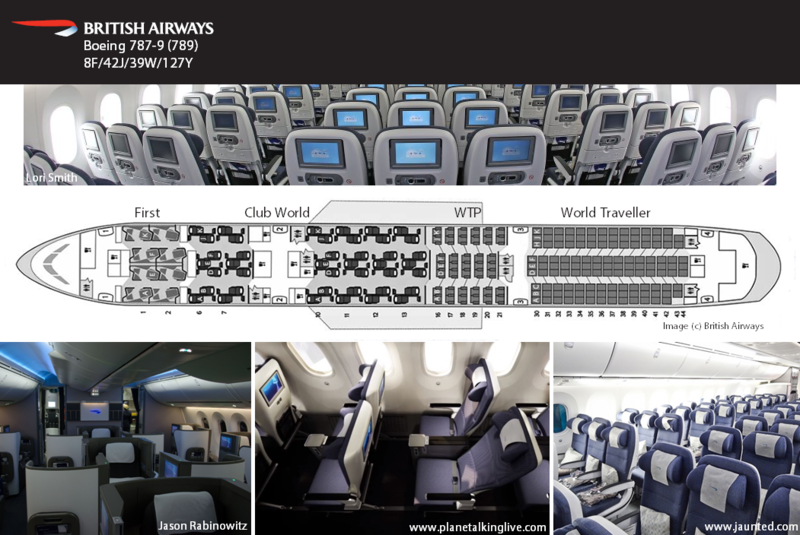 Here is a guide as to the best and worst seats in First, Club World, World Traveller Plus and World Traveller on the Boeing 787-8 and 787-9. Please ask your questions here, and hopefully someone will be able to help! As an aside note: The lavatories on the aircraft have handles to open, rather than a push the door mechanism (as found on the 777). The flush also uses a sensor rather than a button. This has potential to cause confusion at an inopportune moment. The front CW cabin is quieter, and better for service than the mid cabin. 1 & 2 D/F: There is no overhead locker space, as it is taken up by the crew rest. The foot stools on these seats are also at risk of being bumped by a trolley, although they are semi-protected. 3A & K: These are the official C-W-S recommended seats. They have a little extra room, and direct aisle access, as well as good window views. 6A & J: These are recommended, as they are the longest, and offer the greatest legroom, as well as being ideally positioned for getting off the aircraft. 6D & F: These also offer an extra 3 inches of legroom. 7A & K: These have a little extra room, and direct aisle access. Ideal for those wishing to sleep. Unfortunately, these seats do only have 2 windows, one fewer than other seats. Passengers use the WT toilets, which does require a walk back through one of the WT cabins. If you are worried about catering/meal options, it is recommended to sit towards the front of the cabin, as this is where the service starts. An interesting video trip report can be found here. 10A-K: Recommended due to the extra legroom. Reviews for World Traveller on the BA 787 (and indeed many other airlines) seem to largely agree the experience is not pleasant, with 9 seats across in a cabin more ideally suited for 8. The seat is smaller than the WT seat fitted to any other BA aircraft, and this can be felt, especially if you have broader shoulders. Seat pitch is also tight, at only 31 inches. The rear 5 rows are reported to have a slightly tighter pitch than the others. 30 A & K are to be avoided: the emergency exit infringes on your personal space both at upper body and foot level. 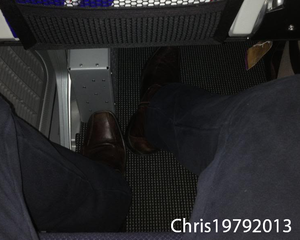 30B-J: Recommended due to the extra legroom. A, C, D, F, H, K seats: an IFE box is under the seat in front of you, which infringes on legroom. Please see the photograph below. 2K: Recommended by ThatT1Feeling. Quieter side of a/c and away from galley. 1E/F: Recommended for couples by All She Wrote. No seats have limited recline. The width of the WT seats on the B789 is marginally greater than on the B788 (owing to reduced aisle width on the former). Reviews for World Traveller on the BA 787 (and indeed many other airlines) seem to largely agree the experience is not pleasant, with 9 seats across in a cabin more ideally suited for 8. The seat is smaller than the WT seat fitted to any other BA aircraft, and this can be easily felt, especially if you have broader shoulders. A, C, D, F, H, K seats: an IFE box is under the seat in front of you, which infringes on legroom. 43A/K: Increased space between seat & cabin wall. Yes, I would say so. You should be able to see through two windows in that seat. I took 7K on a 789 for my first ever flight on this metal tomorrow - so excited!! We've got an upcoming flight to AUH and back in WTP on the 789. Re: Seat selection (as oneworld emerald) showing 16A/E/K blocked in both directions. 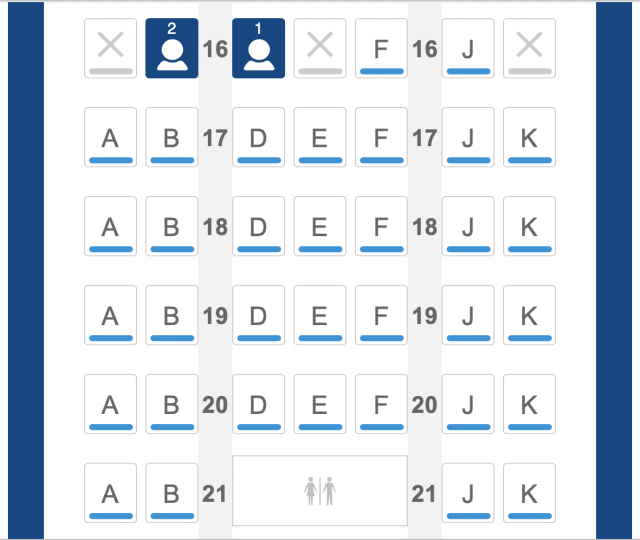 I'd prefer for us to sit in the window pair at one of the bulkheads - I assume the A/K seats at a minimum are blocked for bassinets, but wondering if they're worth shooting for (i.e. not having people recline into you) or if we should just take row 17 instead? Right now I selected seats across the aisle from each other, but obviously that's not ideal. I think you stand a good chance of 16A opening up. Hi all. I'm booked in WT+ on a 787-9 LHR-NRT this week. Paid to reserve 19K as didn't want to end up stuck in a middle seat if it gets busy at OLCI, plus hoping a window seat will be marginally better for getting some sleep. From previous posts doesn't look like there's all that much advantage to the bulkhead seats on row 16. But if 16A or 16K happens to be available at OLCI - unlikely, I know - is it worth swapping? Well the flight is overnight but as it's takes off at 1pm UK time not sure what is your plan to do for 12 hours (sorry haven't ready carefully your post.) I'm 6' tall and for sleeping point of view I found the front row PE seats better. Still not a great sleep but I can manage to stay in a relaxed position. However if you just plan to stay up and watch movies, etc 19K is better as the screen is in front of view and doesn't need to fold it in or out on a flimsy arm. So I think depends how many hours sleep v. watching movies. Thanks Krisz - useful advice! I've been trying to pre-empt the jetlag by shifting my sleep/wake up times. Planning to wake up at 0300 on day of travel so hopefully by around 1600 I'll be tired enough to get some sleep - we shall see. Sorry, no idea what is the PE service on the NRT flight. I guess after take off they will start serving the main course. PE should be served first so it's relatively quick. Hopefully someone can advise you on the food. Also I never ever was able to reduce my jet leg on the NRT route even on CW. BA timing is not the best I would prefer the late evening one but then you have to choose Japan Airlines for that. Dinner around 90 minutes after takeoff and breakfast around 90 minutes to 105 minutes before landing. Krisz and JimMillen like this. Thanks CIHY for the info. I'd personally hope to get the bulkhead. On night flights it is really good. I have pair of xmas socks with rubber soles. Keep them fresh and clean and then pop them on and put my feet up on the magzine rack (remove the mags and pop them in the overhead bin). With the recline it makes it a nice way to stretch out a bit. If taking 7E on the 789 is there any difference between 7D or 7F for the second seat? Most obvious difference would be the presence of the toilet on the 7D side of the 789. I'd think 7F would be preferable for that reason. mattyw and jfallesen like this. What's my best shot here? Solo traveller. 787-9. I'm thinking 6D and hope that E remains empty? I think it's just F forward with no galley between (as it's right at the front)? Nobody jumping over my legs a relative must, while most toilet trekkers will be from rows 10-13 behind and thus not in the way.